Growing on the rough weather worn granite surface of rocks above high water mark on a west facing beach on St. Marys, Isles of Scilly. 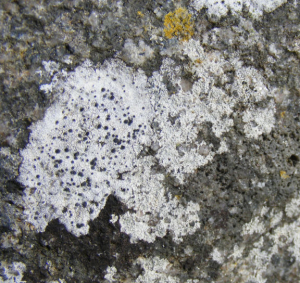 Very pale, almost white, crustose lichen about an inch and a half across, with very distinctive black spots (fruiting bodies?). Growing in the company of both yellow (top) and black (bottom) crustose lichens.